The Residence Halls at the University of Montana are designed for single students and provide housing during Fall and Spring semesters. Students of all academic standings from the University of Montana and Missoula College may live in the Residence Halls. Any student with less than 30 credits and without dependents is required to live in the Residence Halls. Please see the Freshman Residency Requirement for more information. Housing is available during Winter Session for students living in the Residence Halls for both Fall and Spring semesters. Housing is available in the summer for UM students, even if they will not be living in the Residence Halls during the academic year. Convenience - Living on campus allows for the convenience of waking up 5 minutes before class and still making it on time, heading back to your room for a nap between classes, and not fighting the daily parking space battle while trying to get to class. Social - The Resident Assistant staff host social and educational events for students to connect with others in their community and across campus. Students also have the convenience of attending events in the UC and activities hosted by clubs and organizations across campus. Affordability - Everything you need is available for one affordable price, and you do not have to pay separate utility bills including heat, electric, water, Internet, and cable. Plus, you do not have to split costs with a roommate! Safety - Campus Police and UM Housing Staff are available 24/7 as resources for students. In a Fall 2012 survey, 98% of respondents agreed or strongly agreed that they felt safe in their Residence Hall community. Dining - Students have two meal plan options, several dining locations to choose from, and access to a nutritionist/dietitian to help them with any dietary questions or concerns. The University of Montana offers students a variety of options for their on-campus housing experience. We have nine different Residence Halls featuring single rooms, double rooms, triple rooms, three-person pods, and four-person suites. We have one all-female hall, one all-male hall, and seven co-ed halls available to students. We also offer several Living Learning Communities for students within the Residence Halls. We encourage you to check out all of our housing options before applying to live on campus. Please feel free to call the UM Housing Office at (406) 243-2611 with any questions. To view a comparison chart and see which amenities are available in specific Residence Halls, please visit the Photos & Descriptions page. At many universities, it is common to hear the word "dorm" to refer to on-campus housing facilities. Here at the University of Montana, you will find we call our buildings "residence halls" instead of "dorms." We do this as we see our Residence Halls as more than just a place to sleep while living away from home, but as your home away from home. 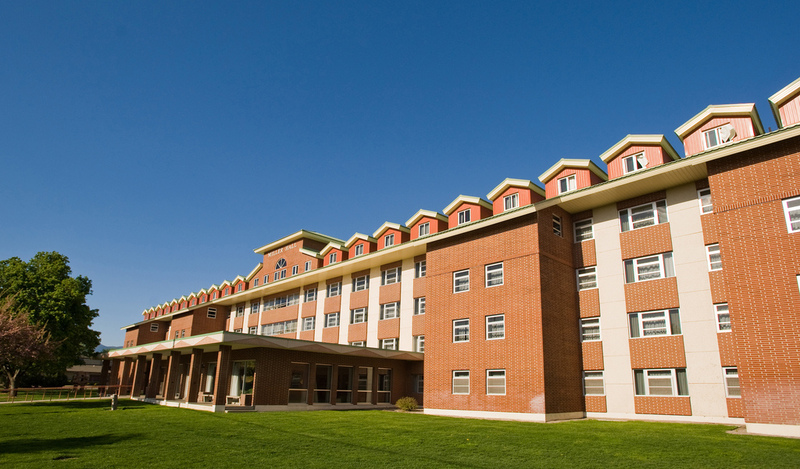 Residence Halls at the University of Montana are a part of the academic mission for students. Students who live in the Residence Halls tend to do better academically and in their social adjustment at the University. We offer social and educational opportunities for our students within their Residence Hall. We have a talented and highly trained student and professional staff here to assist you with your transition to college and to remain as a resource throughout your entire college career. We are proud to be a part of the University experience and proud to have you living in one of our Residence Halls!